Machine Project presents: Aquacoustica :: September 3-4, 2011; 2:00 pm and 5:00 pm :: BELLYFLOP Gallery, Los Angeles, CA :: RSVP is required for attendance, sign up page can be found HERE. A collaborative project of underwater musical performance and state-of-the-art ‘over-water’ live-electronic signal processing. Being a passionate and experienced scuba diver for more than 10 years, Ulrich Krieger will dive into a pool in full scuba gear, tank and all, for at least 60 minutes. 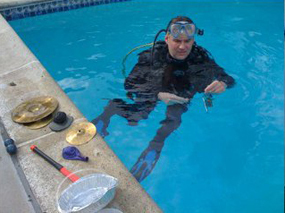 He will sit on the ground or swim around, producing underwater sounds with metal, stone, plastic, and other ‘waterproof’ objects, including ‘underwater didjeridus’, underwater singing, and plastic instruments, like blue toy saxophones. These sounds will be picked up by hydrophones and transmitted to Clay Chaplin, sitting above water, treating and signal processing these sounds to create an electronic ambient soundscape.